New research shows that business customers want to work with utilities that they trust. When businesses have a strong brand relationship with their utility, they then view it as a trusted partner and seek its advice on energy topics. Business customers that have a strong relationship with their utility also show increased appreciation for their utility’s economic development activities and more frequently use its digital and consumption management offerings. These findings are from the 2018 Utility Trusted Brand & Customer Engagement™: Business Cogent Reports™ study by Market Strategies International. Conversely, falling Brand Trust relates to diminished business customer loyalty, advocacy and support for rate increases. In fact, only 28% of businesses with low trust want to purchase energy from their utility, while 40% of those with high trust levels want to use their utility to purchase their energy. 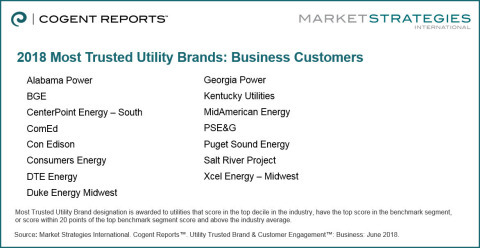 Market Strategies congratulates 15 Most Trusted Utility Brands among business customers this year. The Brand Trust index is based upon 35 questions that relate to a suite of emotional attachment and management performance factors. The study also provides market demand profiles for over 60 value-added business customer offerings. Market Strategies conducted surveys among 8,903 business electric and combination utility customers of the 60 largest US utility companies (based on customer counts). Utilities are given equal weight to balance the influence of each utility’s customers on survey results. Market Strategies will supply the exact wording of any survey question upon request. Market Strategies International is a leading provider of research and consulting services to utility management, trusted by the world’s most successful organizations to help them thrive. We blend primary research with data from our syndicated, benchmarking and self-funded studies to provide clients with exceptional research insight that helps solve their challenges. Our research specialties include brand, communications, CX, product development and segmentation. Our syndicated products, known as Cogent Reports, help clients understand the market environment, explore industry trends and monitor their brand within the competitive landscape. Founded in 1989, Market Strategies is one of the largest market research firms in the world. Read Market Strategies’ blog at FreshMR, and follow us on Facebook, Twitter and LinkedIn.